[William Montgomerie, Scottish poet.] Typed Letter Signed ('Bill Montgomerie') to Lawrence Wilson, on Spain, Gerald Brenan, Shakespeare, with signed typescripts of four poems, and Autograph Note Signed by his wife Norah Montgomerie. 11 Castle Terrace, Broughty Ferry, Dundee, Angus; 8 July 1972. The typed letter (2pp) and the four typescript poems (5pp) total 7pp, foolscap 8vo. In good condition, lightly aged. In good condition, lightly aged. Folded twice. LETTER: TLS to 'Dear Lawrence'. (The recipient Lawrence Wilson is less well-known as a poet than his brother Robert (or Robin) Noble Denison Wilson (1899-1953), known as R. N. D. Wilson.) 2pp, 8vo. A long letter, with seventy-three lines of typewritten text by William Montgomerie, with a long Autograph Note Signed by his wife 'Norah' at the foot and up one margin of the last leaf. The present note is of particular interest for the King's reference to 'the Corps to relieve the Marines of Botany Bay', i.e. Major Francis Grose's New South Wales Corps, which arrived in Australia with the Second Fleet in 1790, relieving the New South Wales Marine Corps, which had arrived at Botany Bay with the First Fleet in January 1788. (King George III took a particular interest in his antipodean colony, which he had instructed Captain Cook to claim for him in 1770. [Lady Hester Stanhope, adventurer and socialite.] Three Autograph Letters Signed ('H Stanhope' and 'H. S.') to Mrs Evelyn of St Clere, with gossip regarding 'the Otways', Lady Frederick Campbell and Charles West. One 'Thursday night' and one 'Monday'. Without date or place. All three letters with their seals in red wax, the first two intact and the third damaged. All addressed to 'Mrs Evelyn | St Clere'. Gossipy, energetic and characteristic letters. 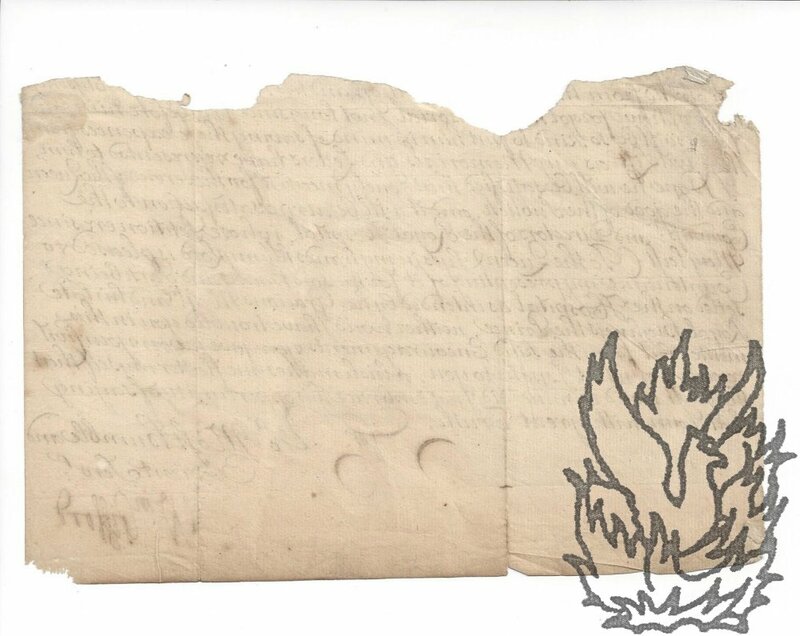 The references to Lady Frederick Campbell date the letters to before her death in a fire in 1807. ONE: Letter written on 'Monday', and signed 'H Stanhope'. 5pp., 12mo. Bifolium and single leaf, the latter acting as the envelope, with text on one side and address with seal on the other. The letter begins: 'You will think I fear my dear Mrs Evelyn there is no end to my eternal scribbles. [Kamehameha IV, King of Hawaii.] Autograph Letter in the third person, to the British Representative on Hawaii, W. W. F. Synge, declining 'Mr. Allan's invitation' and thanking him for the loan of a magazine. 'Hamaikamalama [sic] | Sunday Morning.' No date, but between 1861 and 1863. 1p., 4to. In good condition, lightly aged. Reads: 'Hamaikamalama [sic] | Sunday Morning. 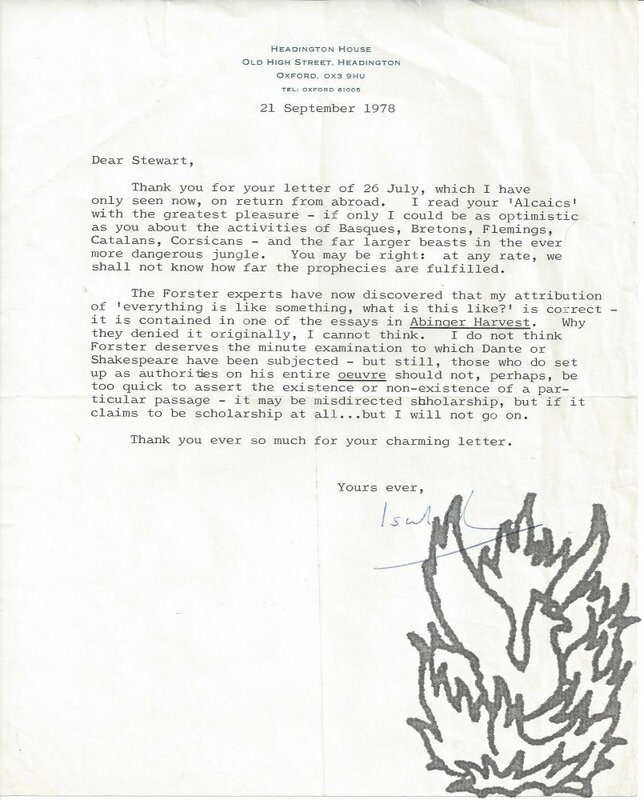 | The King wishes to acknowledge Mr. Synge's Kindness in sending him the “Saturday Review”, which will be returned after perusal. - | The King & Queen regret they cannot accept Mr. Allan's invitation to be of the morning's riding party. - | To H. B. M. Representative'. For information on the recipient William Webb Follett Synge, see his entry in the Oxford DNB. 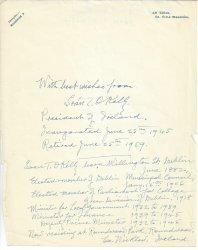 [ Sean T. O'Kelly, Republican ] Autograph (brief) Curriculum Vitae Signed "With best wishes from | Sean T. O'Kelly"
No date, printed address in Irish. One page, 4to, edges sl chipped. mainly good condition, complete. He follows his best wishes (see above) with information about the (formal) political positions he has occupied from President (giving dates of inauguration and retirement ); place of birth (Wellington St, Dublin); when elected to the Dublin Council and Parliament; when Minister for Local Government; and for Finance; when Deputy Prime Minister; current residence at Roundwood Park. Overleaf his name and title (President) in another hand. [ Algernon Charles Swinburne, poet who scandalised Victorian England. ] 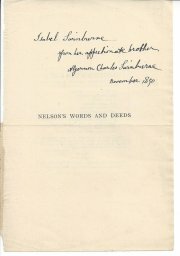 Signed Autograph presentation inscription to his sister Isabel, on fly-leaf of William Clarke Russell's book 'Nelson's Words and Deeds'. Dated in autograph 'November 1890'. On a single 8vo half-title leaf removed from the William Clarke Russell's 'Nelson's Words and Deeds: A Selection from the Dispatches and Correspondence of Horatio Nelson' (London: Sampson Low, 1890). In fair condition, lightly aged and with a central horizontal crease. 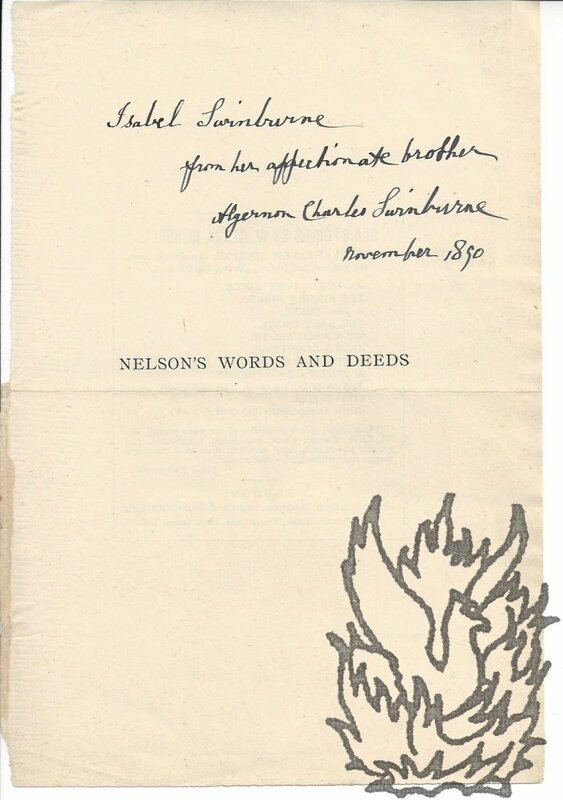 Printed at the centre of the page are the words 'NELSON'S WORDS AND DEEDS', and at the head Swinburne writes: 'Isabel Swinburne | from her affectionate brother | Algernon Charles Swinburne | November 1890'. [ John Dickens; Charles Dickens ] Autograph "Sentiment" Signed "John Dickens"
Small piece of paper, 13.5 x 8.5cm, faintly foxed, otherwise good condition, text clear strong (see image). A flamboyant hand. He writes "John Dickens. | The reputed Father | of "Boz" | Augt 17th 1844". In "reputed" he refers perhaps to Charles's nickname, but his comment has the flavour of resentment perhaps. Since he had no qualms about sending begging letters to his son's friends, perhaps writing such signed sentiments was another financial enterprise. Maidenhead [ Berkshire ]. No date. 1p., 12mo. On bifolium. In good condition, slghtly aged, with small smudge to signature. Collier produced his first Shakespeare Society reprint in 1841. On the reverse of the second leaf Halliwell-Phillipps has written, presumably to an autograph collector: 'Is this any use to you?' Addressing himself to 'Dear Halliwell', Collier begins by informing him that he is returning his 'P[ostage]. Stamp'. He asks him not to be 'affronted', explaining: 'What I meant by any printed note was, that each recipient of my Reprints, who wished to continue, should send me another P[ost]. O[ffice]. [ Margot Asquith to her husband Liberal Prime Minister H. H. Asquith. ] Autograph Letter Signed ('Yr. own | Margot'), to 'Darling', discussing personal matters including her love for her baby and a portrait of 'R' by John Singer Sargent. 4pp., 12mo. Bifolium. In good condition, lightly aged. The letter, the handwriting of which is not altogether straightforward, begins: 'Darling It is so cold here we have to have fires wh. is a blow for the children for having no gov[erness]. I thought we sd. Live on the beach for tea & everything whereas the wind obliges one to wear Xmas clothes you are well out of it'. She continues: 'Jack King & their babies are here I mind no Visitors who are busy & they always are. Their infants are sweet. [ Dunsterforce; Norper Force; Palestine ] A substantial and illuminating correspondence concerning his experiences in Egypt/Palestine, and with "secret" missions, Dunsterforce and Norper Forc. [Egypt/Palestine] 1915-17; [ Dunsterforce & Norper Force ] 1918-20. [ William Johnstone, General Merchant of Launceston, Van Diemen's Land [ Tasmania ].] 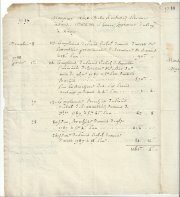 Manuscript accounts of six Australian firms with him: William Bayles; Henry Burge; Westgarth, Ross & Co.; Lewis Cohen; Du Croz, Nichols & Co.; Moses Moss. [ Launceston, Van Diemen's Land [ Tasmania ]; and Sydney and Melbourne, Australia. ] Between 1853 and 1866. See William Johnstone's obituary in the Illustrated Tasmanian News, May 1874. He was born in England and left Somerset for Van Diemen's Land in 1841. He set up in business the following year in Launceston, which had been founded in 1806, and is said to be the third oldest colonial settlement in Australia, after Sydney and Hobart..As the years proceeded he prospered spectacularly, and by the time of his death he was so highly esteemed, that 'many places of business had the front windows partially closed while the shipping in port and the Town Hall had the Union Jack hoisted at half mast'. [ Lord John Manners (later the Duke of Rutland). ] 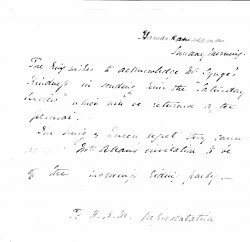 Autograph Letter Signed ('John Manners'), recounting 'a curious episode' at a 'dinner given in the Temple by Mr. Hayward to Louis Blanc'. On letterhead of 3 Cambridge Gate, Regent's Park. [ London ] 8 August 1885. 4pp., 12mo. On bifolium. In good condition, lightly aged. Begins: 'I have a very distinct recollection of the dinner given in the Temple by Mr. Hayward to Louis Blanc, in consequence of a curious episode connected with it which I have often related.' He proceeds to tell the anecdote, which tells how Blanc, 'eager for information respecting the Constitution of the country which was sheltering him', is enlightened by fellow guests 'in a rather solid way'. 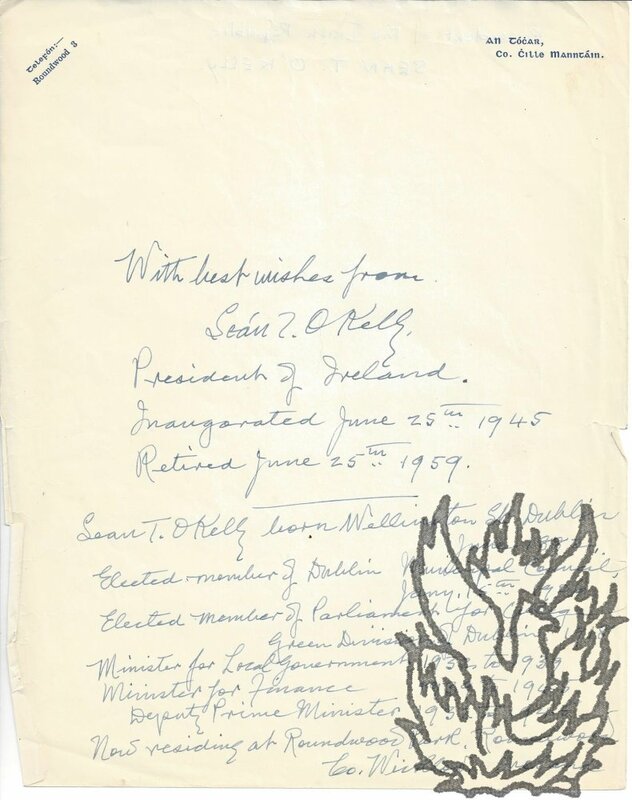 'This bored old Mr.
[ Hugh Foss, Bletchley Park codebreaker ] Draft Autograph Letter UNSIGNED with substantial corrections, all in Foss's hand, to a "Miss Kaye" thanking her fopr a "pleasant evening's dancing". No place or date. Written on notepaper with printed heading "Hon. Secretary, London Fencing Club." Foss was a distinguished cryptanalyst, and his career is described in his entry in the Oxford DNB. At Bletchley Park during the Second World War he was the first person to decode a day's worth of the German Enigma Code (in 1940); and heading the Japanese Naval Section in Hut 7 (between 1942 and 1943). His wife Alison (née Graham, 1908-1979) inspired his interest in Scottish country dancing in the early 1930s. He was Vice-President of the Chelsea Reel Club on its formation in 1935; and became Chairman in 1938. Nancy, le 22 7bre 1787 (date corner chipped but year found within the letter). Four pages including address panel, 4to, bifolium, edges dulled, a little foxing. He outlines what he has done (sending things? 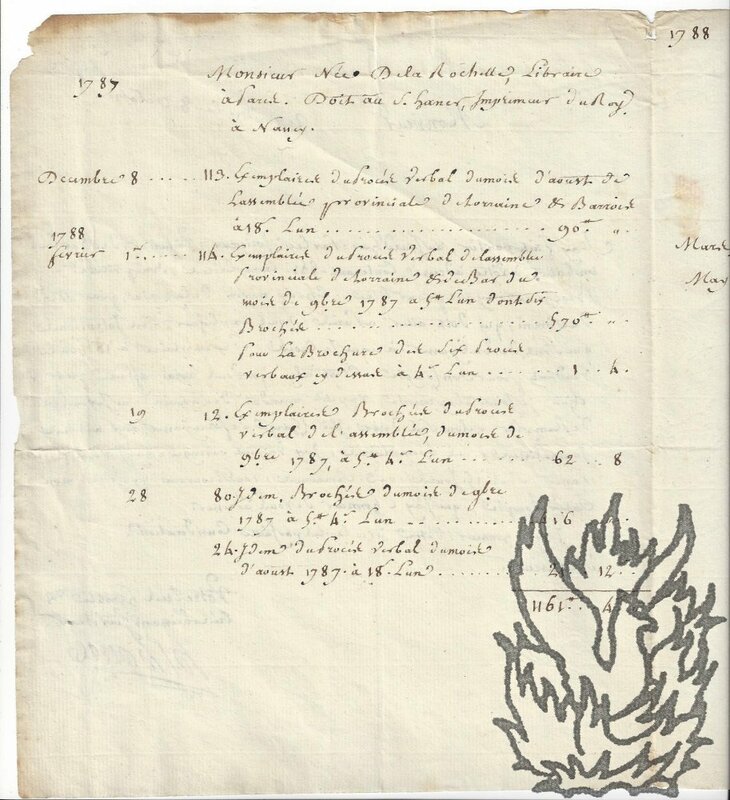 ), in a one page letter, and, on the other two pages, given a detailed account of what he has done for the bookseller from December 1787 to May 1788, including "brochures" (pamphlets). The recipient has noted when he replied. See images on my website. 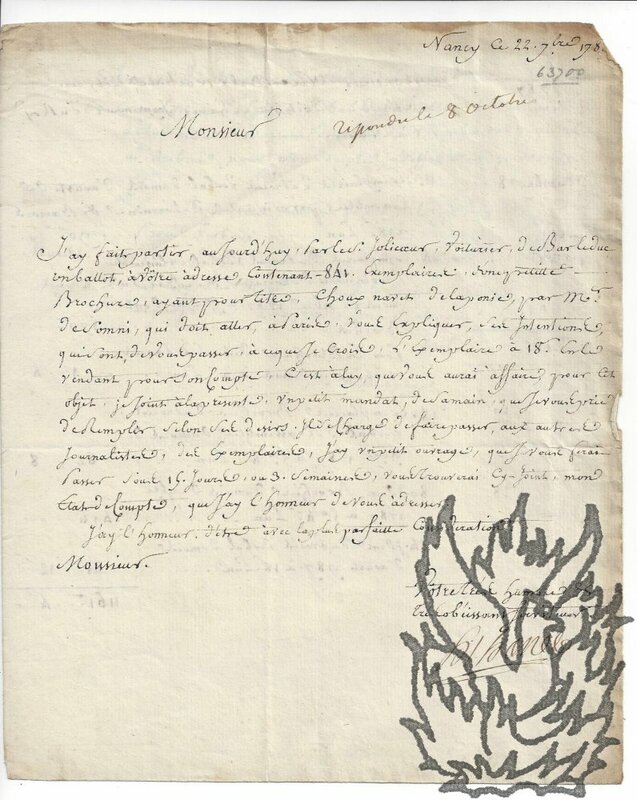 [ Leon Gautier ] Autograph Letter Signed " Leon Gautier" to M. l'abbe Misset, scholar and collector, about the correction of errors for a new edition of his (Gautier's) "Adam de St Victor"
8 rue Varin, [Paris], 10 Nov. 1893. In French. One page, 12mo, good condition. In his best hand. He asks for a "petit service". "Je fais une nouvelle edition de mon Adam de St Victor et je viens vous demander de m'indiquer les corrections que vour jugeriez a propos de faire dans mon 2e edition." He holds his corrections in high regard, outlining further what help he is asking for. Note: Gautier thanks the Abbe Mittet in his Preface. [ Dieulafoy, archaeologist; Dornac, photographer ] Autograph Letter Signed "Dieulafoy" to ["Monsieur Dornac | Photographe | 34 Rue Gassendi | Paris" (address on envelope)., concerned at the terms of an agreement over photographs of his "appartement"
Three pages, 12mo, bifolium, good condition. With envelope. "En vous autorisant ce matin a prendre quelques photographies de mon appartement je n'ai entendu ni vous creez un droit a les reproduire ou a les venre a votre guise. Je vous [?] demande de m'envoyer des tirages pour les examiner, vous y refusez. Je me vois donc force de vous prevenir [...]" He proceeds in the same vein. Note: Dornac took photographs of both Marcel-Auguste and Jane Dieulafoy. He appears in Bernard Marbot, "After Daguerre: Masterworks of French Photography (1848-1900)". [ Dieulafoy;Women at War;archaeologist; Persia; cross dressing ] Autograph Letter Signed "Dieulafoy" to unnamed correspondent, his eminent wife's initiative (training women to do jobs of men who became soldiers (1913). and the circumstances of her death. "Secteur Postal 205 | 23 Janvier 1917". Three pages, 8vo, black border, fold marks, small closed tears, text complete and clear. With official printed stamp next to signature, "Le Lt-Colonel DIEULAFOY | Charge du Service du Genie des Etapes". 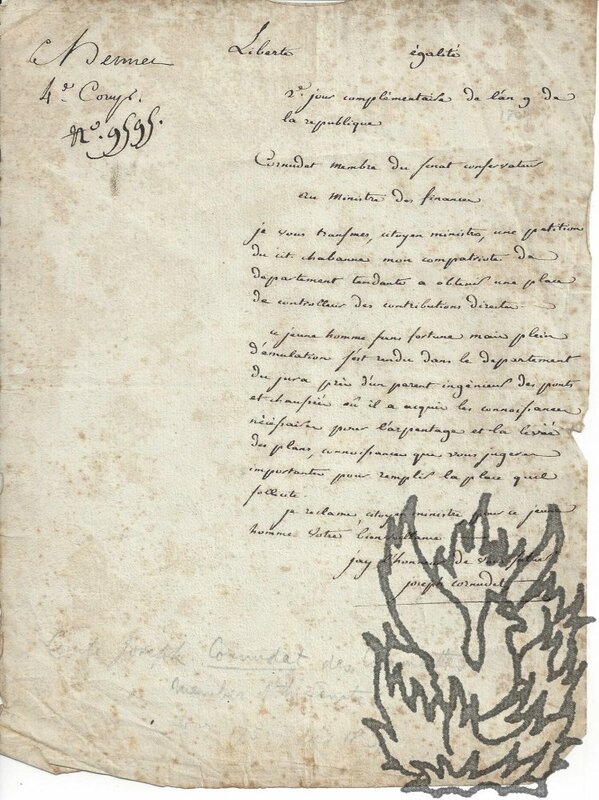 He has received an article in "L'Eveil" by his correspondent concerning his "chere compagne" [ Jane Dieulafoy, distinguished archaeologist, explorer and feminist, who died in May 1916, hence the black border to this letter ]. He specifies the putting in relief of the "initiative prise par ma chere compagne au printemps le 1913 [conscription of women, conference 1913 - see notes below]. [Joseph Cornudet; Revolution Francaise] Autograph Letter Signed "joseph cornudet' "au ministre de finance", seeking a position for a young man from the Jura. [No date apparent] In French and lower case. See image on my website for full text. One page, cr. 8vo, foxed, minor damage, but text clear. 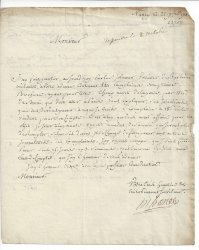 Letter headed "Liberte egalite | [?] jour complementaire de lan g de la republique | Cornudet membre du Senat conservateur au Ministre de Finance| je vous [? ], citoyen ministre, une petition du cite chabanne mon compatriote de departement tendante a obtenir une place de controlleur des contributions directes. | ce jeune homme sans fortune mais plein d'emulation s'est rendu dans le department du jura [?] d'un parent ingenieur des ponts et chaussees [? [ Mona Caird, Scottish novelist and suffragist. ] 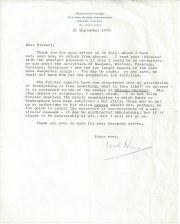 Two Auograph Letters, one Signed 'Mona Caird', discussing her inability to provide financial assistance to the causes she supports. Both on letterhead of 'Cassencary, Creetown, N.B. [i.e. Scotland ]' One dated 'May 6th.' and the other '19th. Dec.' Years not stated. [ Sir Isaiah Berlin, philosopher. ] 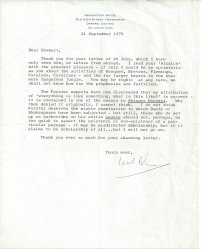 Typed Letter Signed ('Isaiah Berlin') to 'Stewart' [ William McCausland Stewart ], discussing his poem 'Alcaics' and criticising the 'experts' on E. M. Forster for 'misdirected scholarship'. On letterhead of Headington House, Old High Street, Headington, Oxford. 21 September 1978. 1p., 4to. Lightly aged and creased. [ John Masefield, Poet Laureate. ] Autograph Signature ('J. Masefield.'). Date and place not stated. [ Frederick Richard Pickersgill, RA. ] 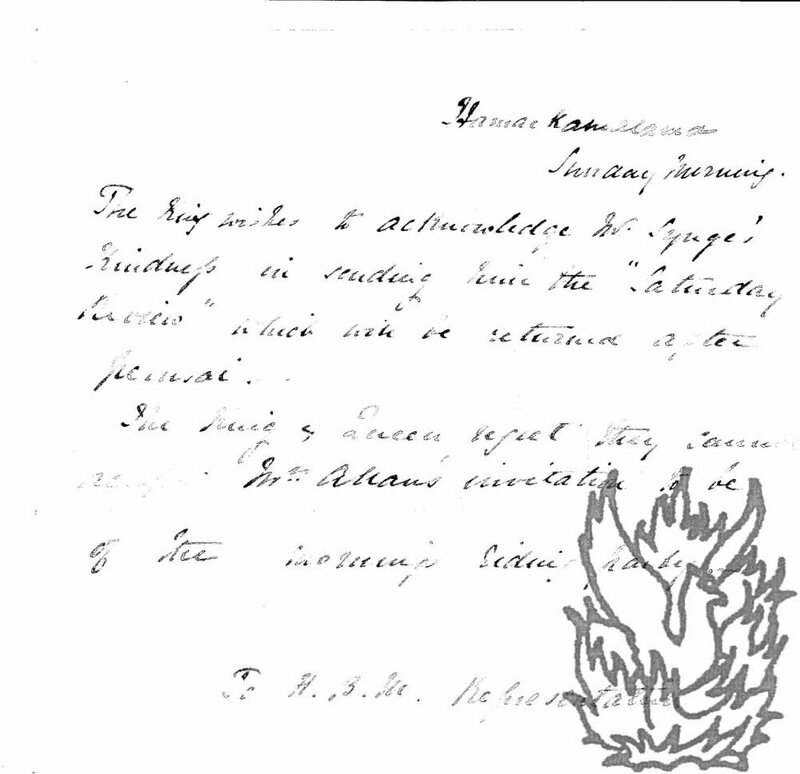 Autograph Signature ('Fred R PIckersgill') on part of letter. 36 Mornington Crescent, 24 May 1853. On 7.5 x 11 cm slip cut from the end of a letter. In fair condition, lightly aged. On one side reads: 'Gentlemen | Your Obt. Servt. 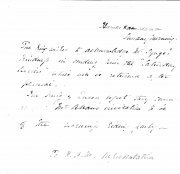 | Fred R Pickersgill | 36 Mornington Crescent | 24 May 1853.' and on the other '[...] at the ensuing half yearly distribution of the Funds of the Institution - | Mr. Varrall is not personally known to me but from the representation of Mr WIlliams ARA [...]'. [ Alberto Randegger, composer. ] Autograph Note Signed to 'Miss Elphick'. Alberto Randegger (1832-1911), Italian composer who from 1854 lived in England. On letterhead of 10 Lower Seymour Street, Portman Square, W. [ London ]. 16 July 1891. 1p., 12mo. In good condition, lightly aged. Reads: 'Dear Miss Elphick | I shall be happy to see you on Wednesday the 22nd. inst at 10.45 a.m. | With kind regards | yours truly | Alberto Randegger'. [ Alfred Emmott, 1st Baron Emmott. ] Autograph Card Signed ('Alfred Emmott') to 'Holdsworth', undertaking to present a petition to the House of Commons. On letterhead of Horton, Chipping Sodbury. 9 April 1904. In good condition, with slight crease to one corner. Informing him that he will be 'very glad to present your petition when the House re-opens'. Seven from 40 St George's Square, SW [ London ]; one on House of Lords letterhead. Between 5 June 1876 and 10 October 1878. The eight letters total 18pp. 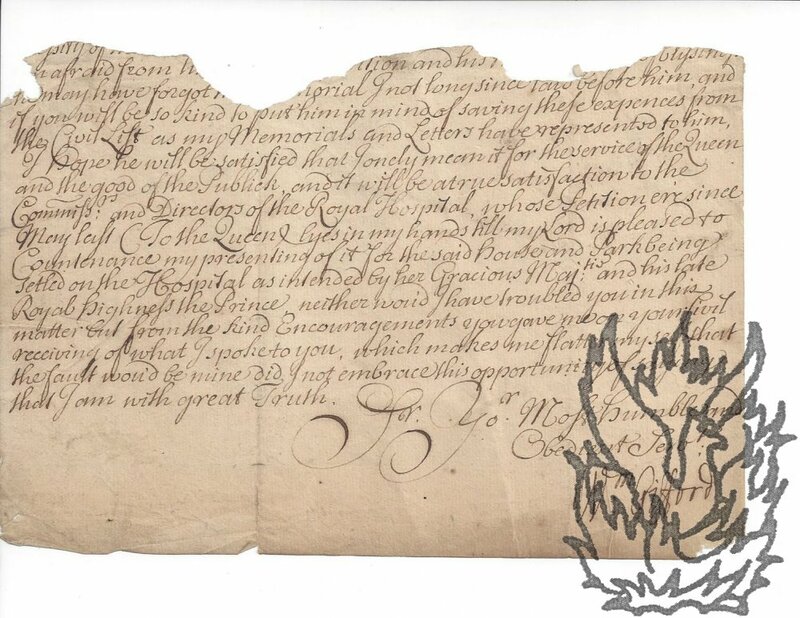 of text, and are accompanied by a printed proof prospectus for the Folk-Lore Society, and a newspaper cutting relating to the Church of St Margaret, Westminster (which Thoms avows as his own, describing it as 'my Jeremiahade on the desecrators of Van Dun'), laid down on a leaf of House of Lords letterhead. All items in good condition, lightly-aged. The prospectus, of which no other copy has been traced, accompanies a letter of 4 January 1878, in which Thoms writes: 'I blush with shame at the proof I enclose that I am getting into my dotage. [ Steamship in Greek War of Independence. ] Autograph Letter Signed by Nicholas Robilliard, and Autograph Note Signed by Thomas Whitmore, concerning the Karteria: 'the Man of War Steam-ship (supposed to be built & fitting for the Greek Committee)'. 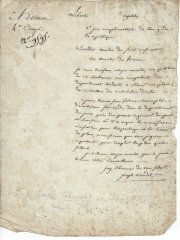 Both Letters dated 8 December 1825. 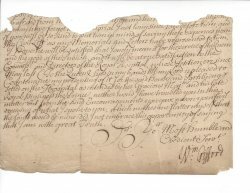 Robilliard's letter without place; Whitmore's note from the Custom House [ London ]. The subject is clearly the Karteria, the first steam-powered warship to see active service. The Karteria was built in 1825 for the Greek insurgentsd by Daniel Brent Shipwrights in the Greenland South Dockyard, Rotherhithe, London. It was financed mainly from the proceeds of the 2nd Greek Loan raised by the London Philhellenic Committee, but also from the private funds of Captain Frank Abney Hastings. Both items in good condition, on lightly-aged paper. ONE: Robilliard to 'Thos Whitmore Esq | Secretary &c &c &c'. 1p., 4to. Headed 'Confidential'. Signed 'Nis Robilliard'.